It's the last Wednesday of the month, and that means it's your favorite challenge at the Simon Says Stamp challenge, Anything Goes! The design team is using Mama Elephant or Avery Elle products this week. If you have some of either, we'd love to have you use them for your entry, too! I chose a fun Avery Elle stamp set called Framed Fonts. I had so much fun making the first card that I made another. This one uses ivory parchment as my card base, Hero Arts Cup O' Joe mid-tone ink, some washi tape, and May Arts Natural Twine. The little hearts are included in the stamp set. I'm entering this one into the Moxie Fab World's Card Creations Week: Washi Tape Challenge. I used another of the sentiments here, with Hero Arts Punch chalk ink for this one, and made a big banner from a paper I love from October Afternoon's Farm Girl pad. I added some die-cut flowers from the Memory Box Bella Bouquet die and a Sizzix leaf branch die, using cardstock that matched the design paper. Again I stamped that little heart in the same colors. 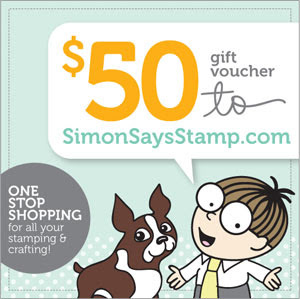 As usual, Heidi, that generous lady, has provided us with another $50.00 gift voucher to spend any way you'd like at the Simon Says Stamp Superstore! I finally found some time to play and wanted to enter some of Cath's challenges tied to the current Card Creations publication. The first one is the Ombre Challenge. I used this repeating dot pattern from a holiday stamp set by The Craft's Meow called Holiday Foundations, and 3 shades of Hero Arts ink: soft pool, tide pool, and splash. the sentiment is also from TCM, from a set called Happy as a Lark. The rolled roses are felt die-cuts, Die-Namics rolled roses. I found a set of yellow and aqua washis recently at Michael's and added the yellow striped washi from Simon Says Stamp's March Card Kit. After placing them on my white card panel, I stamped the sentiment (from The Craft's Meow Easter Blessings) and then embossed it with a Hobby Lobby butterfly embossing folder. After adding the panel to a tide pool layering paper card base, I then added the die-cut butterfly (Cheery Lynn) and some aqua pearls. Love these springy colors together! Good morning! 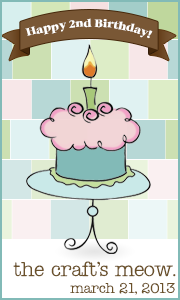 Today is my day for a post on The Craft's Meow blog, and since it's also my birthday today, I made a birthday card. I stamped the open chevron from Geometric Foundations on several papers from Graphic 45's Secret Garden Patterns and Solids, then cut them apart into arrows and pieced them vertically. I glued some of the arrows only in their centers, and pulled the edges forward for a little dimension. 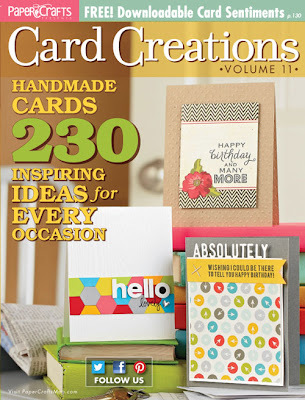 I'd like to enter my card into the Card Creations Week: Chevron Challenge at Moxie Fab World. I am in love with the new Pale Tomato mid-tone ink by Hero Arts! Here I used it on both the Painted Flower stamp and the Tweed background. The green ink is Field Greens, another mid-tone, and my sentiment is from a Simon Says Stamp exclusive called Like Your Style. 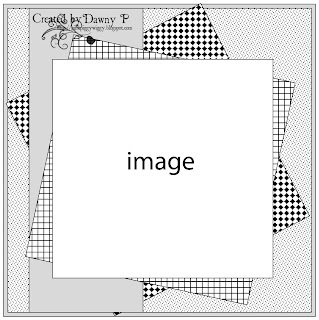 I'd like to enter this card into Moxie Fab World's Card Creations Week Chevron Challenge. I used these mid-tone inks: bubble gum, butter bar, cornflower, and field greens, and the sentiment is from Made with Love. After stamping my panel, I used the Houndstooth embossing folder to add some texture to it. Thanks for visiting today - hope you have a special day! Here's my take on the Tuesday Trigger at Moxie Fab World. I just finally got some of the limited edition colors of distress inks from last year, and I decided to blend 3 of them (peacock feathers, evergreen bough, and mowed lawn) onto white cardstock to make this background. Maybe because my foam pads were new also, they weren't blending as nicely as usual, so I spritzed the paper with some water, and then things got easier. After that panel dried, I used a Hobby Lobby butterfly embossing folder to give it some more dimension. then I stamped the butterfly and my sentiment on some scraps of the same and added them on top. The big solid flower is from Penny Black's Petal Party. I used a sentiment from the Hero Arts clear set Huge Hugs, and some smaller miscellaneous leaves and flowers. I made a mask of the large flower to use as I stamped. The inks are bubble gum, butter bar, orange soda, tide pool, and green hills mid-tone inks. I placed my stamped panel onto a card made from Pool Layering Paper, which is a perfect match to the tide pool ink. I added a liberal sprinkle of gems to match the ink colors. Welcome to the finale of our 2nd Birthday Celebration at The Craft's Meow!! Today is the day that we unveil all 4 newest stamp releases at The Craft's Meow with a blog hop! Before we get down to business, we are also announcing today the debut of our brand spankin' new Gallery at The Craft's Meow!! Now when you see a stamp set you are interested in, you can find all kinds of card samples using it, right there in our store! Please come visit us there! Coming back to the Blog Hop, I hope you've enjoyed all the gorgeous creations so far from my teamies! You should have arrived here from Julie's blog. If you'd like to begin at the start of the Hop, just visit The Craft's Meow Blog for a listing of all of the blogs participating. Once you get started, you will be linked to the next blog in line. I used the balloon stamp, stamping it 3 times for each grouping and changing up the colors between green, dusty turquoise and blue. I added one of the smaller elements from the set, and then overstamped one of the sentiments in black. I framed my stamped panel in a paper from Lawn Fawn's Bright Side Collection. Here's a reveal of the Sweet Birthday set - don't you just love all the fun elements - there's something for everyone! 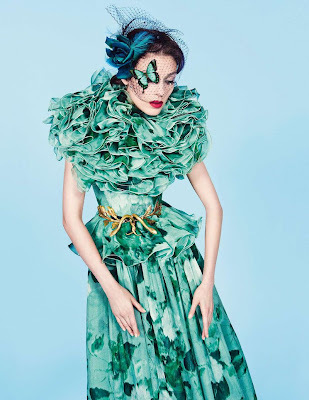 All of the papers are from My Mind's Eye Lost & Found Madison Avenue collection. I added a doily, some seam binding dyed with spun sugar distress ink, and some pink pearls. Love how this one turned out! You can now view and purchase all of the new March sets at The Craft's Meow Store! Your next stop is at Lindsay's blog. Don't forget to leave a comment at each stop, because we're giving away all FOUR new sets to TWO lucky people!! (It isn't necessary to leave comments on all of our blogs, but you'll increase your chances if you do). The deadline for comments is 8:00 PM PDT, Saturday, March 23. Thanks for stopping and Happy Hopping! If you're here to see my The Craft's Meow Release preview for day 4, please click HERE. Happy Wednesday, my friends, and almost Happy Spring! It's time for another challenge at Simon Says Stamp, and this week our theme is Easter or Spring! I stamped the beautiful Hope Collage on white cardstock, then colored in the flowers and stems with markers. the panel was trimmed out and framed with a spring green cardstock. My pink printed paper panel is from Carta Bella's Beautiful Moments pad. To finish I added the Perched Reed Bird, adding a black pearl eye and popping him above the stamped panel, and some pale pink pearls. I also recently received this Memory Box Blooming Violet die and my first KaiserCraft paper pad; this one is called Hey Birdie, and I thought the colors were perfect for spring. Violets are a sure sign of spring for me. I added a Hero Arts sentiment from an old SparkleClear set called Happy Thoughts, and some candy pink pearls to the flower centers. I hope my cards and those of my teamies have put you into a Spring mood! What will you make this week? Heidi has provided another $50.00 gift voucher for the random winner! Please come visit us at Simon Says Stamp to see what my teamies and Guest Designer Dee made you this week! I stamped just one of the silhouettes inside the beautiful frame, added one of the sentiments, and trimmed it out, then framed it with an oval doily die-cut. My papers are Hero Arts Pool layering papers and Basic Grey's Lucille papers, and I added some aqua pearls. Please visit The Craft's Meow blog to see what my team-mates and our March Guest Designer Stacey did with this lovely stamp set. 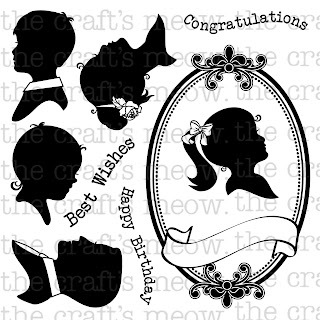 Leave a comment at The Craft's Meow blog by 8:00 PM PST tonight for TWO chances to win this darling Sweet Silhouettes set! That's right, Lisa is offering a set to TWO lucky random commenters at The Craft's Meow Blog, in honor of our birthday! And please come back again tomorrow for our traditional blog hop, where we reveal the new stamps. You'll have a chance then to win all FOUR of them! I chose just one of the smaller images and one of the sentiments from this large set for this card. I stamped the group of 3 roses repeatedly (using masking) to make an oval wreath, and then stamped a sentiment inside. Then I colored them in with markers and added some pearls and gems to match. I used just one of the "layers" that Nina has given us and made a 4-layer cake, stamping on 4 different colors of cardstock, cutting them out, then stacking them together on the cakestand and adding the adorable little birthday banner and the rose cluster. Papers are from Graphic 45's Secret Garden Patterns and Solids paper pad. If you haven't already, please visit The Craft's Meow blog to see what my team-mates and our March Guest Designer Stacey Schaefer did with this lovely stamp set. I know you'll love seeing some of the other images and sentiments from it. Leave a comment at The Craft's Meow blog by 8:00 PM PST tonight for a chance to win this new Take the Cake set! In honor of TCM's birthday; Lisa will be giving away TWO of these sets to 2 lucky commenters there! And please come back again tomorrow for a preview of the last of our new sets! Aren't these cupcakes fun? I went with a blue and green color combo today, and mixed the cupcakes with some of the included sentiments and stars and added some gems to twinkle in the same colors. My background paper is from Lawn Fawn's Bright Side Collection paper pad and my stamped panel is framed with a blue BoBunny dot cardstock. This simple card uses the darling little vase of flowers and another of the sentiments, matched up with papers from K&Company and Paper Inspirations, and again I used little gems in the same colors to add a little sparkle. 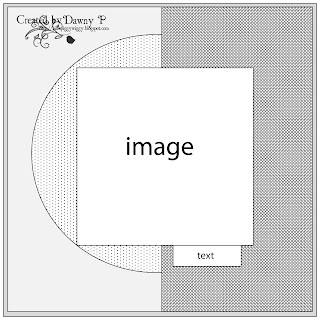 The doily is a die-cut by Die-Namics. Don't forget to visit The Craft's Meow blog to see what my team-mates and our March Guest Designer Stacey Schafer did with this adorable stamp set. 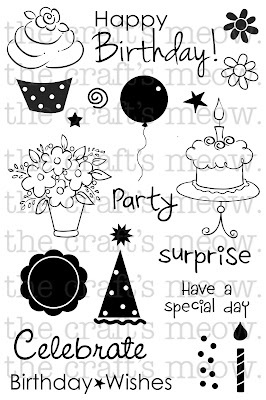 Leave a comment at The Craft's Meow blog by 8:00 PM PST tonight for a chance to win this new Sweet Birthday set! Lisa will be giving away TWO of these sets to 2 lucky commenters at The Craft's Meow Blog, in honor of our birthday celebration! And please come back again tomorrow for another preview of one of our other new sets! I used scattered straw distress ink to stamp the lion, and matched it up with some gold strips from My Mind's Eye Lost & Found 3: Oliver paper pad, and a brad made by Basic Grey. Here's another "punny" card. This one uses papers from Studio Calico's Classic Calico Collection, a strip of washi tape, and a button from October Afternoon's Midway collection. I used Wet Cement and Charcoal mid-tone inks for my stamping. Please visit The Craft's Meow blog to see what my team-mates and our March Guest Designer Stacey Schafer did with this fun stamp set - you are going to be blown away with their creativity! Leave a comment at The Craft's Meow blog by 8:00 PM PST tonight for a chance to win this Birthday Pun set! In honor of our birthday, Lisa will be giving away TWO sets to 2 lucky random commenters there! And please come back again tomorrow for another preview of one of our other new sets! First I made my own panel with the flowers and leaves and that cute group of 3 dots. Then I cut it in 3 equal parts, stamped my sentiment on the bottom panel, and framed it with the medium color of the Pool layering papers. This went onto a white card base. The Hero Arts inks that I used here are Soft Canteloupe, Pale Tomato, Butter Bar, Green Hills, and Tide Pool. I pulled these colors from the papers that are included in the kit. The March Card Kit is sold out, but you can still get the Flower Friend stamp set! There's another card in the post just below using these stamps again - click HERE. Here's my favorite card yet using supplies from the Simon Says Stamp March Card Kit. First, the stamp set has my blog name as a sentiment, so that was a given. And I wanted to make a stamped floral background panel for it, and chose blue and yellow so that I could frame it up with the yellow-striped washi tape included in the Kit. I used Hero Arts Cornflower and Butter Bar mid-tone inks, and shabby shutters distress ink. As always, thanks for your visit.....I know how many blogs there are out there, and so I treasure each of you who chooses to come see mine! I really like this card I made for the Moxie Fab World's Card Creations Week: Chevron Challenge. It uses stamps from 3 different companies and some new papers. I used 2 of the 5 colorways in the Graphic 45 Secret Garden Patterns and Solids paper pad, and stamped the chevrons from The Craft's Meow Geometric Foundations on 2 prints and 2 solids, then cut them out. The flowers and leaves are from Lawn Fawn's Flutter By stamp set. I cut apart the layers and pieced them back together, separating them with dimensional foam stickers. And the sentiment is from Hero Arts Heydey Sentiments. I always equate these colors with Easter, and so this will be used for one of the many spring birthdays I have upcoming. I used the stamps to mimic that paper on the left side of my card, then framed up the stamped panel and popped it above the card base. I used Soft Canteloupe shadow ink for the flower; it's a perfect match to the papers! The yellow horizontal stripe at the bottom is the Washi tape that was included in the kit. The Kit is now sold out, but you can find the elements I used separately. The papers are one of Lawn Fawn's newest releases, "Daphne's Closet", and the stamp set designed by Kristina Werner, "Flower Friend", is my favorite so far! You'll be seeing lots more cards using this kit! Hello friends! Welcome to another challenge at the Simon Says Stamp challenge! This little stamp is called Easter Chicks. I bet most of you don't remember when children got live chicks that had been dyed pastel colors for Easter..... That memory prompted me to color my chicks in pastel colors. Then I chose papers from Jillibean Soup's Southern Chicken Dumpling Soup and the aqua panel is Lasting Impressions seaside checks. The sentiment is from the Hero Arts Celebrate Everyday set. After stamping my sentiment and gluing on all the paper panels, I ran the whole card through a Sizzix Dots embossing folder, and then popped my stamped panel on top of it. This time I paper-pieced the chicks, using papers from a BoBunny Soft Shades Double Dot pad. The sentiment comes from Hero's Everyday Sayings set. The buttons are Hero Arts also. Sweet Heidi has provided another $50.00 gift voucher to use at the Simon Says Stamp Superstore to a random winner of this challenge! Will it be you this week? Happy 3rd Birthday to Lawn Fawn! !